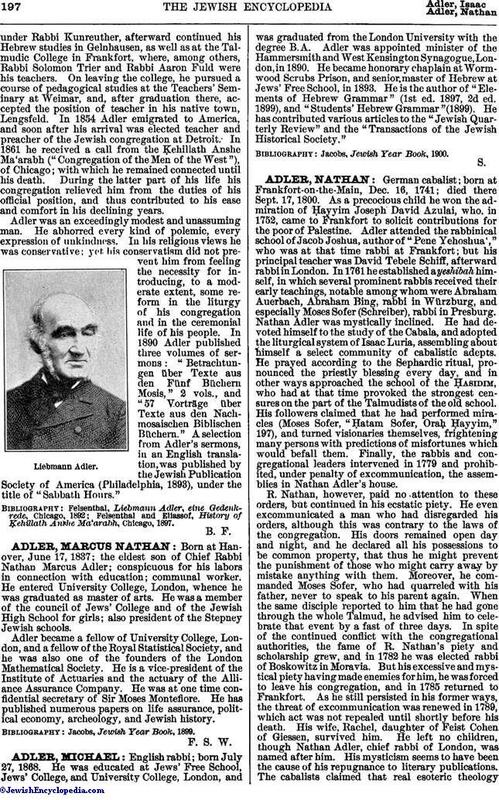 Born at Hanover, June 17, 1837; the eldest son of Chief Rabbi Nathan Marcus Adler; conspicuous for his labors in connection with education; communal worker. He entered University College, London, whence he was graduated as master of arts. He was a member of the council of Jews' College and of the Jewish High School for girls; also president of the Stepney Jewish schools. Adler became a fellow of University College, London, and a fellow of the Royal Statistical Society, and he was also one of the founders of the London Mathematical Society. He is a vice-president of the Institute of Actuaries and the actuary of the Alliance Assurance Company. He was at one time confidential secretary of Sir Moses Montefiore. He has published numerous papers on life assurance, political economy, archeology, and Jewish history.